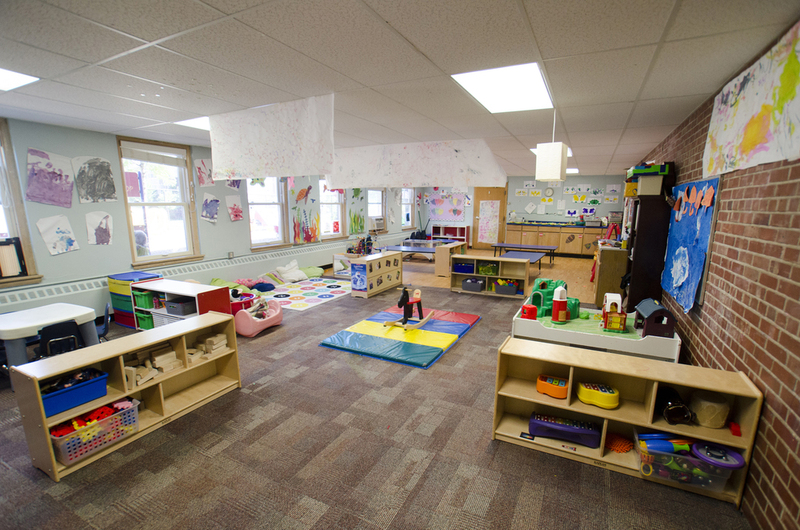 Children in the Toddler Room are between 16 months and 33 months. Our ideal child-teacher ratio is one teacher for every five toddlers. One, two, three go! is the name of the game in the Toddler Room. These little ones need a safe and fascinating space to run, play and excite their natural curiosity. They climb, jump, and parallel play with friends, while learning to share, color, paint, give big hugs and wash their hands. The toddler program offers your child the opportunity to explore, sing, dance, talk, and play—inside and out. Breakfast, lunch and snack are served at tables and chairs with cups, plates and spoons and everyone clears their plate when they’re done. Toddlers learn to go potty and work on dressing themselves. Each afternoon, the toddlers snuggle up with a favorite blanket or lovey, wind down with soft music and take a nap on individual cots. Your child will do all of this with encouragement, redirection and gentle reminders of how to be a good friend, helper and listener. We keep them entertained, engaged, learning and most of all safe, loved and well cared for. Our toddler room includes some of the most engaging story-tellers you will ever meet! The toddler room is always changing--with artwork, pictures and interactive experiences made by the children. Activities encourage creativity, self-expression and fun.